Who doesn't love a FRESH new healthy cookie recipe, especially when it's actually got nutrition in it? My kids were so happy when I tested this recipe this past weekend (it's 100% my invention by the way!) and we were all happy when they actually turned out! Now that gluten is a nemesis to my body's healing from an autoimmune disorder, I avoid it as much as I can...but that doesn't mean I love all things gluten-free - I can't stand how dense many things turn out with a lot of gluten free flours out there. So this recipe uses a $5 gluten free flour from my neighborhood grocery, nothing too fancy. I bake so rarely now, it's worth the splurge! Try it and see what I mean. No rock-hard recipe here! Pre-heat oven to 350 degrees. Place parchment paper on 2 cookie pans. 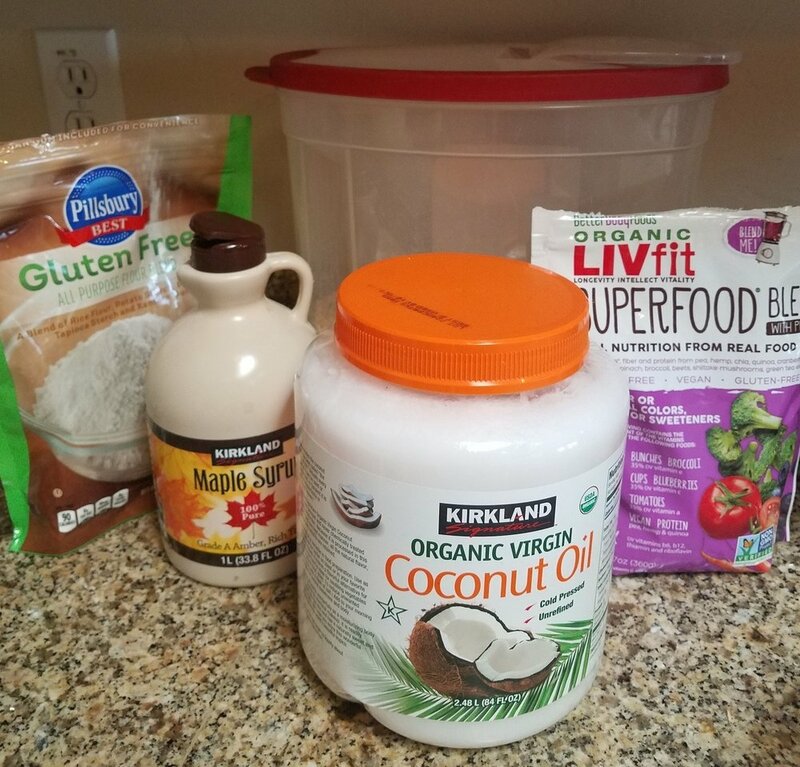 Combine the dry ingredients (first 6 ingredients listed!) and stir together, then set aside. Mash the butter, coconut oil, and sugars and syrup together by hand, or use a handheld mixer for ease. Set this bowl aside. Whip the 2 eggs, adding in the vanilla extract. Add into the bowl with the sugars, butter and oil and stir all wet ingredients together well. On low speed with the hand mixer (or by hand) slowly add in the dry mixture to the wet ingredients bowl, a little at a time. Then slowly, add in the fruit and veggie powder and bran flakes until fully mixed. Drop a Tablespoon of dough on the trays, about 1.5 inches apart to allow for rising. Bake on 350 degrees for about 10 minutes, check the cookies, if they are browning on edges, they are done! Remove them from oven and let them sit on hot cookie pan for about 2-3 minutes. Move them to a cookie rack to finish cooling. Ready to enjoy! You can freeze extras for quick grab snacks for kid's lunches, after-school snack or part of an easy breakfast by serving them with a smoothie or banana! If you like, you can always add in nuts, dried fruit or mini-chocolate chips for extra fun or texture. You could also replace the coconut oil with peanut butter, and add in 1/2 cup mini chocolate chips to have a PB and choco snack! After you try them, pop back over here and tell us what you think! Bet your kids/family won't even know they are eating such a great blend of nutrition!